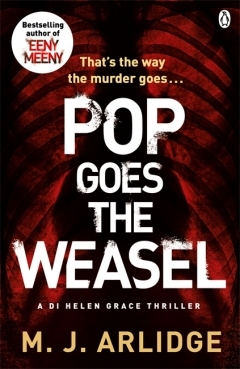 Pop Goes The Weasel opening line: The fog crept in from the sea, suffocating the city. This killer is attacking men who lead a double life, and until the team can work out the reason why they will not catch her, for the one thing they know for sure, it is a woman who is brutally murdering men who stray from their marriages. A man’s body is found in an empty house. His heart has been cut out and delivered to his family. He is the first victim, and DI Helen Grace knows he will not be the last. But why would a happily married man be this far from home at night? This book follows on from a previous novel, and it took me quite some time to work out what had happened before. I find this the most frustrating thing when I have not read the first book in a series, when the author relies too much on what has happened in the past, assuming the reader will know. Once I had got over that hurdle I really enjoyed this book. Here Detective Inspector Helen Grace is chasing a serial killer and caught up in this drama is her relationship with people who survived the last case with her, an adopted child, her own needs and a new boss who is intent on derailing her. I know right!!!!! !, messes me up totally when the author confuses you with constant references to the previous book….. I’ve been known to down the book & go & get the 1st book if it’s good enough too. Have a great week Tandy. I will have to look out the first book – this sounds like my kind of book – thanks Tandy.